One of the most important factors when selecting a wedding photographer is undoubtedly the right amount of experience. Too little experience and you could be left with photos that didn’t quite do your big day justice or photos you aren’t proud of enough to display on your walls. And for weddings with meaningful traditions, such as a Indian wedding ceremony, it’s even more crucial to find a photographer who knows how to capture them in a beautiful way and how to follow the proper etiquette. After all, this celebration will be about the joining of two families and is a sacred ritual that should be taken seriously and without any faux pas! If you’re having a Indian wedding, be sure your wedding photographer has experience with the following traditions before you sign the dotted line. Here's just a few of the ceremonial traditions your Indian wedding photographer should know about! The Baraat is a crucial part of the Indian wedding experience involving the procession of the Groom. Traditionally, the Groom will ride a white horse (called a “Ghodi”). As a more recent development, some grooms opt for a luxurious car. In some instances, the use of an elephant may also be chosen. During the procession, upbeat songs are played as the baraatis (family, groomsmen, and friends) dance and walk along with the Groom. 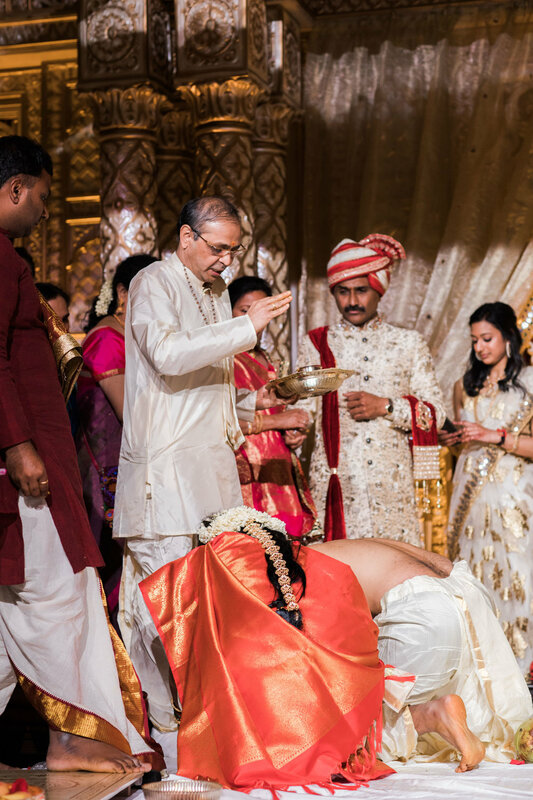 Once the procession comes to a close, the Bride’s family will meet and greet the Groom and his family as the apply tilak to his forehead. At this time, a ritual called aarti is typically carried out, traditionally, to ward off evil eye. Then, the Groom is off towards the Milna Ceremony and the greeting of the Bride’s male family. Two very common parts of traditional Hindu weddings involve the colorful wedding attire and henna designs. Instead of wearing white, Indian brides wear red and often combine it with gold embroidery. These colors symbolize commitment, spirituality and fertility. Henna (also called mehndi) has been used for over 5,000 years in Hindu weddings, making it one of the longest-known wedding traditions in the world! These artistic henna designs are typically placed on the Bride’s hands and feet during a mehndi party with other women attending the wedding. Definitely a fun and beautiful tradition that ought to be captured on camera (and one of our personal favorite aspects of Hindu weddings)! 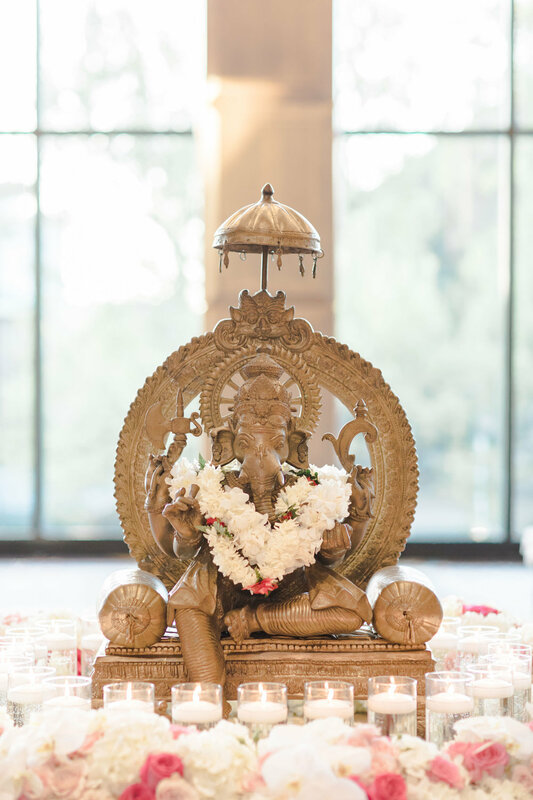 Sometimes performed a few days or the night before the wedding, the Ganesh Puja is one of the first pieces of a traditional Hindu ceremony. Lord Ganesh, or Ganesha, is known as the Hindu elephant god of wisdom and salvation. The Puja takes place in order to remove any obstacles for the main wedding ceremony and bestow good luck onto the soon-to-be married couple. More commonly performed during South Indian Hindu weddings, the Jai Mala involves the exchange of floral garlands between the Bride and Groom. This part of the wedding ceremony symbolizes both the meeting of two souls and the joining of their families. It’s also often followed by an exchange of gifts. One of the most important parts is the Saptapadi, which is when the Bride and Groom tie their garments together. Then they take seven steps or make seven circles around a ceremonial fire while they recite vows to each other about their marriage. This is one of the most exciting parts of the wedding, and one your photographer should be ready for! After the Saptapadi, the couple looks up to the sun and the polar star for the Surya Darshan and Dhruva Darshan. Tranditionally, the sun is there for them to seek blessings for a creative and passionate life, while the north star is symbolic help for the couple to remain steadfast. Then their parents begin to bless the Bride and Groom with rose water. One of the last parts of the ceremony is when the Groom applies the sindoor (a red powder) to the parting of the Bride's hair and places a mangalsutra around her neck, both of which are symbols of her marriage. If you’re planning a Hindu wedding/Indian wedding and looking for an Indian wedding photographer in Louisville or any part of Kentucky, consider hiring a husband and wife wedding photographer team! Between capturing moments from a variety of angles and having coverage for multiple traditions, there are dozens of great benefits to having two professional photographers during your wedding ceremony. Reach out to us about your wedding ceremony today! 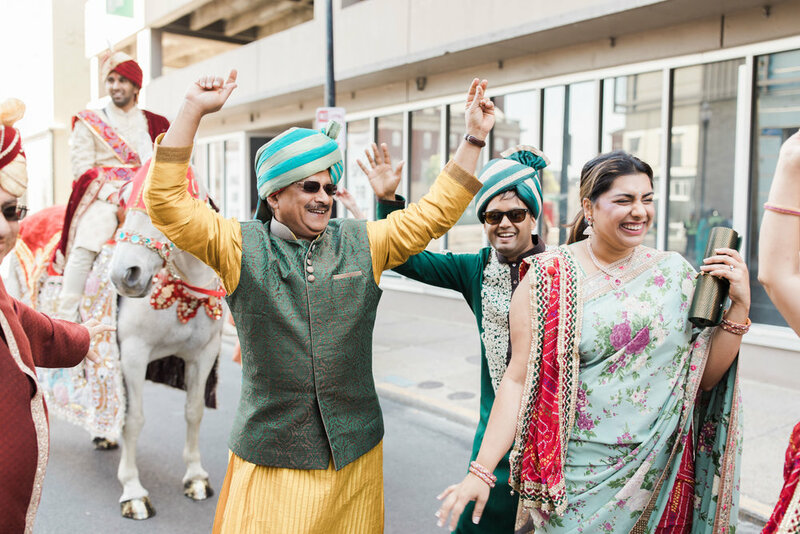 If you’d like to see more images from this The Omni Hotel Indian wedding in Louisville, Ky, that was photographed with Mir Anwar Studios be sure to check out more highlights!